That’s no moon, that’s a Venn Diagram…? I’ve got a mission statement. Nothing like establishing a galactic empire. No, closer to crafting a fully operational story sharing station where I can target people in need of good fiction and zap it into their brain from somewhere far, far away. The important thing to note is that nowhere do I mention other writers in this mission statement. Over the past year I’ve shared my experiences about the road to self publishing with anyone willing to listen. I’ve talked about my writing process, marketing ups and downs, distribution woes, and even the yawn-worthy business of being a self-employed author. During that same period, I’ve seen my followers and fans grow from dozens to hundreds. I’ve met some wonderful people and exchanged ideas, tips and tricks, and even cautionary tales about this demanding, fictional lifestyle. Lately though, you may have noticed a few changes. A bit of a shake up in the topics I discuss. I’m refining my marketing approach which will mean saying goodbye to posts about writing and more posts about things my readers (and I) want to geek about. This isn’t to say I’m shooting my writer friends in the exhaust port. I’ll continue to trade tips, share my successes and failures, and provide critique for fellow authors but in other venues. Over the coming weeks, I hope, if anything, to become more involved in professional circles. But the ultimate goal of this self-publishing venture is to get my fiction in the face of as many readers as possible. Those in the bigger “red” zone up there, not just the tiny overlap. Take this as my final tip for self-publishing success: Get on mission and don’t wait for readers to come find you, go and find them. With that, prepare for the shakeup – a disturbance in the force. And as soon as I get this wrinkled, green muppet off my back, expect to see more stories and cool stuff. Right here. Coming Hyper-Soon. I’ve enjoyed the writerly posts, but I’m looking forward to the new stuff as well. If you decide to continue the writerly stuff elsewhere, please let me know. Thanks, Ange – As mentioned, you and anyone else interested in the behind-the-scenes stuff should feel free to email me or call and I’ll help out as much as I can. Thanks again for keeping up with the changes here! Thanks so much. 🙂 You’ve been gracious and generous in sharing your experiences. I’m curious about how to reach more readers. Today is the first day since the launch earlier this month I haven’t sold any copies of FINIS., which is sobering though probably not earth-shattering by any stretch, and I’m curious what methods of taking it to the reader have worked so far for you. Don’t get too worried about the sales. 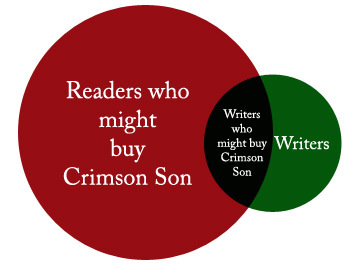 Crimson Son is hardly in bestseller territory, and so far I’ve had to work -hard- for every one that’s left the virtual or physical shelf. From what I understand the first thousand or so, unless you are trad pub with a decent marketing push behind you, you have to practically hand sell. If you’ve got a solid book, momentum will get behind it. If you aren’t submitting to reviewers, engaging potential readers, and searching for ways to reach your market every single day, it will get lost in the millions (billions?) of books out there. I haven’t researched shorter works but make sure the categories are right (look up a comp and compare) and make sure the price is competitive. So far, my data is a bit of a jumble and I can’t pinpoint one thing that has helped the most. After the buzz wore off, sales dropped to a trickle, so I’m back in the marketing trenches to make sure the word stays out there as we approach the holidays. About to start a GoodReads giveaway soon and I hear great things about those. I don’t recommend paid advertising (though I have experimented with it and I have some paid blog tours coming up so we’ll see how that goes.) Don’t be shy about telling people! It will be a slow, tough road at first which, at least I’m told, gets better! The single most important thing I’ve heard and seen evidence for is “write another book”. Because having a full shelf draws more attention, more fans and makes Amazon algorithms happy. Sometimes a disturbance in the force is just the right way to find what you’re looking for. Maybe. Or maybe I don’t have a clue as to what I’m talking about. 🙂 But I think it’s important for authors to show there “other sides” and not just the writer side. I’d hazard to say that most readers are not themselves writers (though I’ve no concrete statistics on this), and those readers will be more interested in the things that make you, well, you. So, I definitely understand where you’re coming from, and I think it’s a great idea. Not all changes are bad! Sure, I suppose it gets your name around professional circles, and there is something to be said for that, but as a self-pub, I’m already eschewing the traditional channels and not waiting for anyone to give me permission or validation to sell my fiction. So while those professional circles are great, honest-to-god readers are much better and much more necessary for the road ahead! Ugh, the first thing I saw, upon reading my last comment, was the typo. Seriously, I can’t believe I wrote “there” (someone smack me). And yes, the collection of writers trading likes — that seems to be what I’ve noticed, too. I’m not self-published (I’m lit mag published, that’s it), and I don’t really have a ‘following’ of any kind, but the majority of people who DO follow me are writers. And though I’ve made great friends among them and learned a lot, having 4,000 twitter followers comprised of nothing but writers (I don’t have even close to 4,000 twitter followers, but this is just the sake of making my point) isn’t, in my opinion, conducive to finding the readers. Also, I’m cynical, and I’d hazard to guess that most writers that follow me wouldn’t be likely to buy my book (if I had one out) unless they were close to me or I gave them a free review copy since they’re all vying for the same thing. So, yes, as you said, it’s very insular. This is a typo friendly zone. That said, the better I know someone (along with being into the genre they write) the better chances I will buy their book. And for a select few like my crit group, I’ll buy any damn thing they write whether I normally delve into that genre or not. And while I write all this genre stuff, I have a thing for literary fiction, so if you don’t mind send (or even post) a link if you’ve got one! With my first book so new, It hasn’t found its readers yet. Working on getting other titles out and wondering where (besides Goodreads) I can connect with readers. You can also try Library Thing and Shelfari. I’d also find out about the things your target market likes to do (happily, these are often things us writers like as well!) and engage people in those settings. Unless it is a promotional event setup for you and your book though, don’t give everyone a hard pitch and sell. It is a tough balance to find and even tougher for anyone who may be a bit introverted. As I mentioned, from all the poking around I’ve done, I find the most important factor in success for any author has been producing more books, so keep writing!